The What: Adder Technology is set to its first dual-head high performance, 4K IP KVM matrix over a single fiber at NAB 2019. 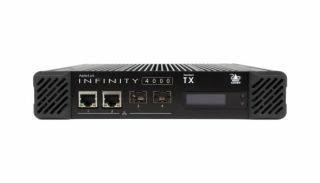 The company says the launch of the ADDERLink Infinity 4000 Series (ALIF4000) is perfectly timed to support IP KVM users as they transition their broadcast and production environments to 4K. The What Else: Adder says its ALIF4000 delivers pixel-perfect, color accurate video quality, audio and USB to single or dual 4K screens—benefitting broadcasters, post-production professionals, or VFX specialists looking to improve their workflow and increase flexibility by making 4K content accessible from a single position or location. The Bottom Line: Full compatibility with the existing Infinity range means the ALIF4000 can be phased into an existing network without disruption, downtime or the need to rip and replace. The product can be seen at NAB 2019 in Booth SL8620.